during the freeze a 2 week beta-test period is given to users to test the upcoming release candidate (deployed in the form of a nightly build). 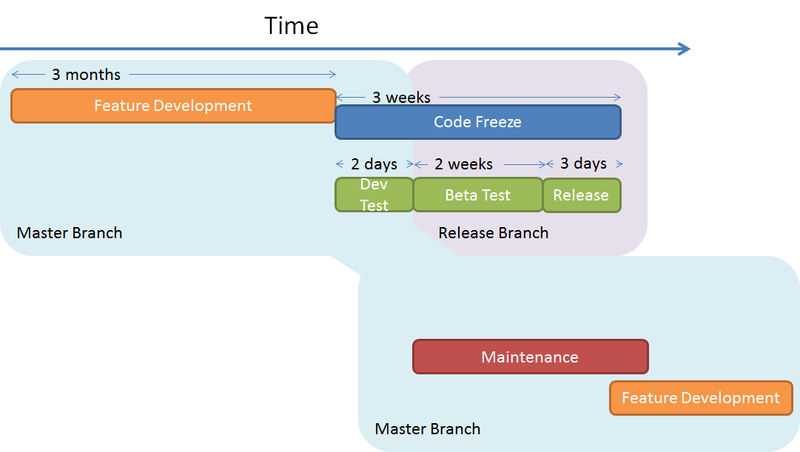 Feature development occurs on the master branch. At the code freeze, once all pull requests marked for the release have been merged, a new branch is created for the next release. Fixes found during testing are merged to the release branch and the master remains open to changes not destined for this release. The maintenance period generally overlaps with the tail end of the code freeze. All maintenance tasks occur on the master branch and should not disturb the release branch.